Tutto l'anno, un luogo di soggiorno magico! Con terrazze ombreggiate, Oak Grove e una bellissima vista del Petit Luberon, questa ex fabbrica di ocra restaurata con autenticità offre un ambiente unico per la vostra vacanza. La pietra, mattoni, ferro, legno e vetro per riflettere la luce in Provenza in questo sito ocra classificata come parte del patrimonio storico della regione. La nostra vasta proprietà privata boscosa (7,5 ettari) che si trova nel Parc du Luberon offre calma e serenità sotto il sole del sud, il tutto a pochi minuti a piedi dal bellissimo villaggio di Roussillon. Mobili da giardino e barbecue sono a vostra disposizione per indimenticabili serate estive nella dell'illuminazione architettonica esterna delicato. Con il suo camino e soggiorno accogliente, nostro capannone gas perfettamente riscaldata è anche un posto molto confortevole in cui soggiornare per l'inverno e mezza stagione. le cabanon est tres confortable et parfaitement Equipé. La piscine est agréable, bref un tres bel endroit pour decouvrir les environs ou/et se reposer. L accueil est tres sympa. Merci beaucoup pour votre visite, nous avons été ravis de vous accueillir à Roussillon. Quelle plus belle récompense pour nous que de vous savoir satisfaits de votre séjour ? Au plaisir de vous revoir quand vous voulez ! My family spent a delightful week in the Le Cabanon during July/ August. As the photos on the website show, the cottage has been tastefully renovated using high quality materials. The kitchen incorporates high-end appliances and is well equipped for preparing family meals and there is plenty of dining space inside and outside the house. Despite temperatures in excess of 35 degrees during the week of our stay, the location and construction of the cottage meant that it provided a cool shelter from the intense afternoon heat. Furthermore, the swimming pool was well maintained and the pool deck offers a good mixture of space that has direct sunlight and is shaded from the surrounding forest. 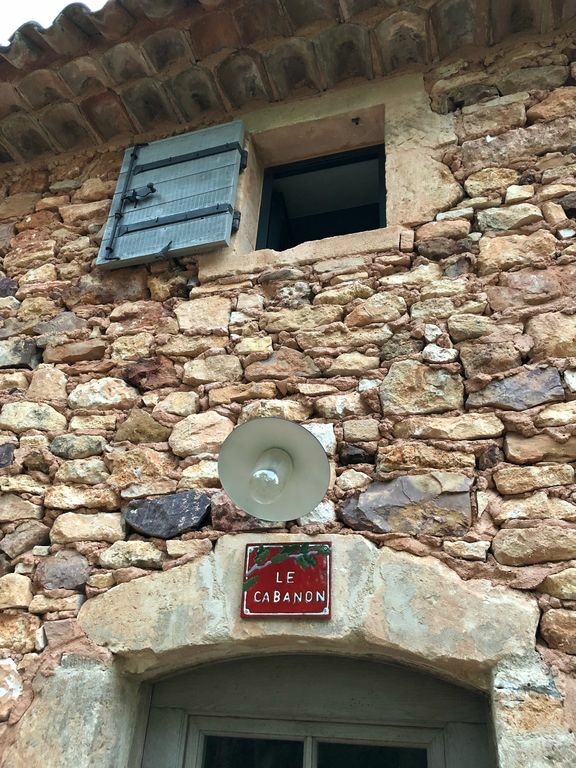 The property is ideally situated offering a good amount of privacy and seclusion but is only a 15 minute walk away from the village centre in Roussillon (up a steep hill). It felt safe for our children (ages 3 and 6) to freely run around and explore the grounds surrounding the house. Furthermore, the owner kindly provided the key to secure the swimming pool area when it wasn't in use. The owner and his family, who stay in the larger house within the property, were very hospitable and took care to ensure that our stay was comfortable and advised us on the local attractions. Our security deposit was also returned within a week of our departure. The only drawback of the property is that the cottage lacks a dedicated wifi router and the wifi signal is transmitted from the main house on the property. This was most often an insufficient signal, which resulted in us having to stream data from our phones that also suffered from a weak signal. With all the delights that this charming area has to offer, however, this drawback can be easily overlooked! Thank you so much for your visit in Roussillon, we were very happy to welcome you. Thank you as well for your valuable feed-back, for sure it will allow us improve our rental in the near future. What a better reward for us than your satisfaction after your holidays ? Please, come back whenever you want !!! Urtümliches Haus, innen vollständig modernisiert, gut eingerichtete Küche, davor Terrasse und Außengrill. Absolut ruhig gelegen in einem eingewachsenen riesigen Grundstück, mit besonderem Charme durch die Gebäude und Anlagen einer ehemaligen Ockerfabrik. Eigener Pool, Wiesen und Kiesflächen zum Boule spielen runden das Angebot ab. Ca. 10 min Fußweg nach Roussillon (Bäckerei, kleiner Einkaufsmarkt, Gaststätten etc.). Ca. 15 min Autofahrt in die nächtse Kleinstadt Apt: Wochenmarkt, Fußgängerzone, Supermarkt, Bio-Supermarkt, Tankstellen etc. Die Gegend um Roussillon ist landschaftlich sehr abwechslungsreich: Wandern, Radfahren für jede Anspruchslage möglich, aber auch Sideseeing und Städtetouren z.B. : Avignon, Axe en Provence. Die Verständigung und Betreuung durch den Vermieter ist in mehreren Sprachen (auch Englisch) absolut unproblematisch. Die Angaben aus dem Online-Inserat sind vollständiog korrekt. Die Endreinigung ist wahlweise in Eigenleitung oder durch Vermieter möglich. Thank you so much for your visit in Roussillon, we were very happy to welcome you. What a better reward for us than your satisfaction after your holidays ? Please, come back whenever you want !!! This is a beautifully converted ochre factory in the woods outside Roussillon in the Luberon valley; the owner has put a great deal of time, thought and effort into the renovation and all the facilities are of a very high standard. It is described as a cabin, but is more like a detached house, with an open plan lounge/kitchen/diner downstairs and two double bedrooms upstairs. 1) As well as Roussillon, the location is close to Apt, Gordes, Lacoste and Bonnieux, and less than an hour from Lourmarin and Avignon. 2) Beautiful en-suite bathrooms - fitted with rain showers - are attached to both bedrooms. 3) It has the best-equipped kitchen I've ever used at one of these rentals. All the appliances are premium, brand-new and full sized. François has supplied an impressive range of utensils, including a coffee maker and a pressure cooker! 4) There is a pool shared with the other cabin, surrounded by some very comfortable loungers. It isn't heated though, so it will be cold in early season. 1) If you need an internet connection, the wi-fi hub is located in the main house and the signal here is very weak. There is a strong G3 connection, however, and we found this more reliable. 2) It really is secluded; the approach is along a rough stretch of private road which can be difficult to negotiate towards the top after heavy rain. We found it easier to park half-way up the hill, by the owner's house. The cabin is in the middle of woods, which was an attraction for us, but be aware that it is pitch black at night (although François has strung some attractive fairly lights through the trees to guide you up/down the hill). 3) As is usual for the south of France, recycling has to be carried down to the main road and they don't do glass. 4) It is a walk up a pretty steep hill to get to Roussillon, but it only takes 10 minutes and the views are spectacular. Overall, I'd be very happy to stay here again. The place is gorgeous, the price is very reasonable, François is very approachable and helpful, and it is a stunning part of the world. Merci beaucoup pour votre visite, nous avons été ravis de vous accueillir à Roussillon. Quelle plus belle récompense pour nous que de vous savoir satisfaits de votre séjour ? Au plaisir de vous revoir bientôt !! !